A giant board is sitting on a table in FULL VIEW of the audience. The board shows the backs of 52 cards. At this time, the audience names ANY card and chooses ANY number from 1 to 52. NO FORCE! When the board is turned over, the faces of the cards are on the other side. The cards are in the SAME ORDER as the opposite side of the board. The cards are counted one at a time. The chosen card is found at the chosen number!!!! This works 100% of the time no matter what card or number is chosen. A FREE application has been included! After the app is initially downloaded it will work independently of the internet (no need to have internet access). The application works on most tablets and smart phones. The trick works perfect without the application, however the application make the presentation easier and more interesting. Don't know if this would ever be a feature of my show, but it is DIABOLICALLY clever — the kind of out-of-the-box thinking and implementation I've come to associate with Gaeton Bloom and will now ascribe to Astor as well. The effect is as advertised. 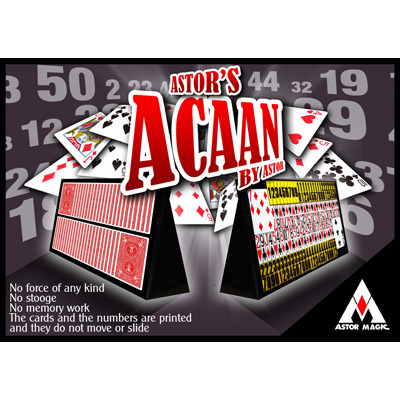 To all appearances, you have on a stand a panel depicting the backs of 52 cards A card and number are freely named and the panel is turned over. Two rulers are aligned with the faces of the cards. The rulers are numbered, the first from 1 to 26 and the second from 27 to 52. There's no trickery here; they legitimately allow all to see which card is at which number. Sure enough, the freely named card is FOR REAL at the freely named number. The design of this effect is ingenious . The working out of the solution in all its myriad details is of mind-boggling brilliance — a miracle in itself. That said, there are a couple of caveats. In performance, there is a need to recognize and distinguish small symbols, some of which look far too much alike for comfort. But that's a quibble. The biggest problem is the instructional video, which is rudimentary in the extreme. Though it has chapters, accessible by some but not all DVD-playing apps, they are not indexed or accessible from a menu. Astor's explanations are lengthy and wordy, often unaccompanied by relevant and necessary demonstration. Also, English is not Astor's first language, the acoustics are resonant and Astor is not miked, resulting in a frequent and maddening need to repeat and decipher. There are no problems that cannot be overcome with some perseverance, however, and once mastered, you have a novel version of a very-much-in-vogue effect on your hands, ACAAN without the laborious counting of cards. If this kind of thing is your cup of tea, drink up!